After six long hours at the Farmington, I had landed only one fish. 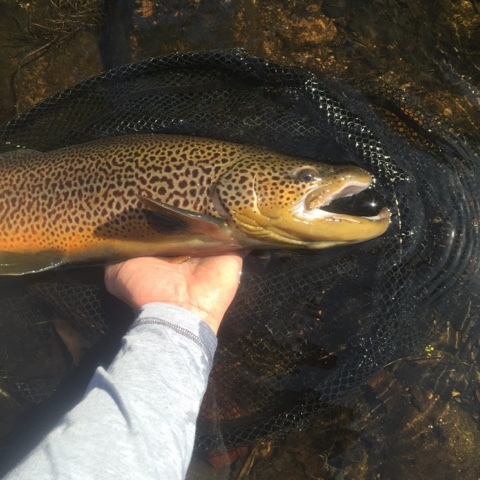 A very nice 6″ brown. Spots A was absolutely barren. Spot B yielded one take and the aforementioned fish. Very few bugs, the air was cold, and only a few rises in the morning. As some midges popped off, I was hopeful for more activity. Nada. I had with me two fly rods, one for dries and the other for tightline nymphing. When the dries didn’t deliver, I switched. But, tightline nymphing didn’t produce either. I don’t know about you, but when things are slow, I often catch myself getting a bit down. I feel like giving up. Instead, I decided to go to Spot C. In the past, I’ve forced myself to keep fishing, for, often, something good happens soon thereafter. I saw my line tighten, and I set the hook. Immediately, I felt something heavy and a flash of orange. A brookie? The fish just bore down and just bulled its way around. It took me down river, and so, I followed it. I’ve learned the hard way that when a big fish is on, you want to keep it up river from you, or the hook may pop off. Gradually, I used side pressure to ease it into calmer water. That’s when I saw the tell tale marks of a brown. And, not just any brown. This one was huge and had a very pronounced kype. Of course, I immediately became nervous. The fish came close to the net a few times, but then surged away each time. After many hours on the water, I now know how hard to max out on my tippet. I use fluorocarbon, and it really can handle a great deal of stress. Also, thank goodness, I have seen the Jensens’ “Side Sweep” video. I’ve learned to use that technique when a big fish is on. It worked. This ended up being a 22″ buck brown. My phone camera isn’t working that well, and the pictures don’t capture how gorgeously buttery-yellow-orange this fish’s belly looked. But, I’m glad I got some pictures. This brown now is my personal best fish. 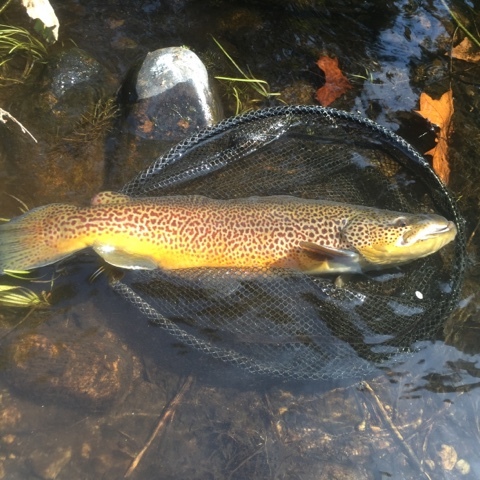 My prior one was a 21″ brown, also at the Farmington. Weight: 4.5 to 5 lbs., est. Last, many thanks to Brian from Westport, CT, for helping me with the picture taking! Thanks! I am still in disbelief that it all happened. Congratulations on your fish. Looked to be in excellent health considering the low water. Fishing has been very slow for me too these past few weeks. Looking forward to cooler weather with Olives! Yes, it seemed to be fine and revived very quickly. At one point, it was vigorously thrashing around in the net to try to get out of it. Congrats! One of the brood stock browns stocked from this spring, a few of them had that same marbled look to them. A few were pushing 26 inches or greater. Interesting. I had thought hatchery trout had mangled fins. This fish had perfect fins from what I saw. Regardless, it was fun to land it! Thank you, Torrey. It's very helpful to know the "signs" for what is wild or not. I'm a huge fan of what DEEP has done. I really hope their suggested fear that low water will lead to tough winter ice for trout will be unfounded. The Farmy is a special river. Beautiful and well earned brown trout. I fish exclusively the Swift with the low water conditions we have, and have found action to be sporadic. I managed a couple of brookies, one a nice one at 12" along with a swing and a miss by a brown trout on a deer hair caddis dry fly. 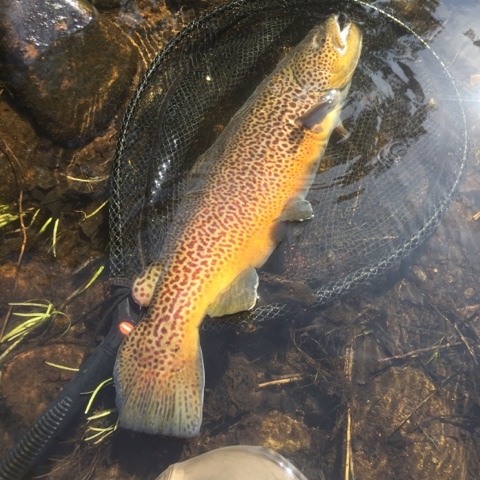 The fish came completely out of the water and how it didn't get hooked is beyond me, but I could clearly see the golden underside of sizable brown trout. Thanks for the heads up, P.A. September at the Swift is a very brutal month, at least for me. I'm not hitting that river all that often these days, but I do recall the action comes up dramatically in Oct. The brookies will be spawning then and into November, making for many eggs in the drift. The 'bows will be gobbling them up and all that biomass in the water will make them active. Great point! I've have plenty of days when it's just too darn slow. But, you're right, certain moments keep me motivated and going. 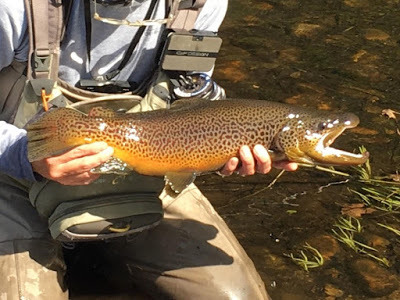 Beautiful Brown! Sounds like it made up for an otherwise slow day. 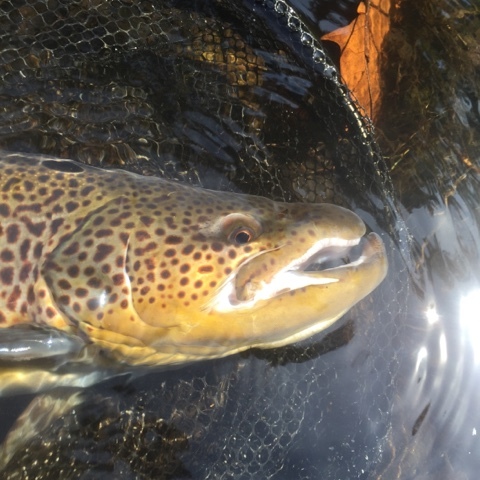 Hopefully this drought breaks soon, it's been pretty tough for NE trout fishing? My next outing will be the 2nd trip this year to the San Juan in New Mexico, hoping for another epic trip. Let's hope next spring we get more water in NE to carry us well into the summer and again in the fall. Have fun! How about a guest post?